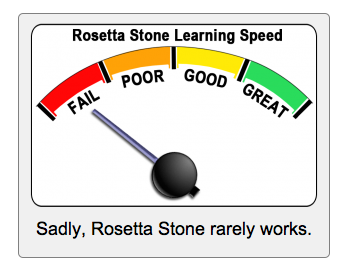 Home › Construction Spanish › Why Rosetta Stone is a 2-liter bottle of Mountain Dew. I fell off the wagon last Friday. I bought (and drank) a 20-ounce bottle of Mountain Dew. Part of my New Year’s Resolution was to undo my addiction to Dew. There was shame regarding my resolution dissolution, sure, but what really bothered me was the price tag. That price may seem reasonable, unless you saw the end cap display featuring 2-liter bottles of Mountain Dew for 99 cents. How can 67.628 ounces of high-fructose corn syrup cost .99 when 20 ounces costs nearly twice as much? More of something should cost more than less of something, right? Not really – products that give you too little or too much are discounted. For the sake of contrast, consider buying 20 ounces of Mountain Dew. You can open it immediately and drink it in public. Try that with a 2-liter bottle of Mountain Dew. Even by the forgiving American standards of gluttony. More of something isn’t necessarily better. The right amount of something is valuable. At Red Angle, our language training products are narrow, specific and limited. We deliver more value by doing less. Our 6-week Safety Spanish program (daily videos, book, workbooks, 2-disc CD, & flash card set) requires 8 minutes per day. That’s it. We’re not going to waste your time teaching things you don’t need to know. But naturally, some people think more is always better. I take a stab at it…. “Why do you want to learn Spanish?” I ask. OK – to achieve that, will you really sit in front of your computer for an additional 200 hours this year? That’s an additional 5 full weeks of computer atrophy…. Let’s say you did, although we both know you won’t… do you think you’ll learn how to say “hardhat” in your 200 hours of Rosetta Stone? No, you won’t. It’s a mass consumer product. Their primary customer is everyone and anyone with a wallet. You – a Safety professional – are not anywhere close to their targeted consumer. Do you think you’ll learn how to say “scaffolding” ? Will you actually learn how to speak Safety Spanish? Or will you learn about farm animals and fruit? No, no, no, no, no no… and YES. With Red Angle’s Safety Spanish program, you get less, but you get what you need to solve your problems quickly. Yes, Red Angle is less content. But it’s the right content – the content you care about. At Red Angle everything is relevant, specific, memorable, and entertaining. 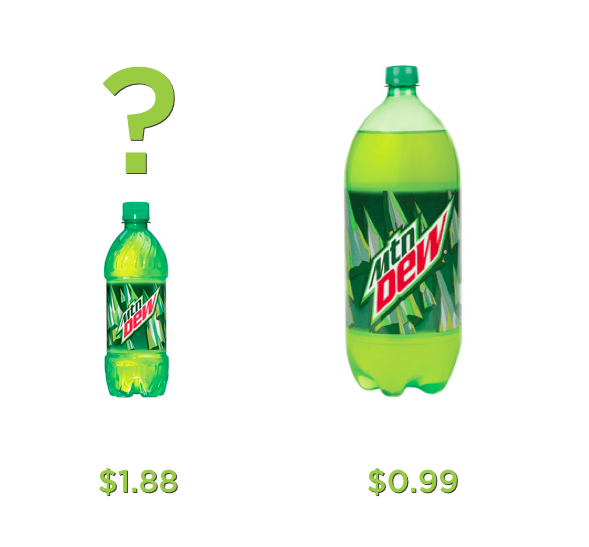 Next time you do the Dew, buy the 2-liter and see what kind of reactions you get….